We've found a way to enjoy travel memories at Christmas. When Thanksgiving is over, we get to decorating for the Christmas season... and we are able to give thanks for those travel memories at Christmas... for a whole month in fact. Our kids like to bring home Christmas tree decorations as souvenirs. Lots of places have Christmas stores these days, but if they don’t, or if it's not the right season, we can't always find what we want. Now we take the kids to look at key chain racks in stores that sell tourist curios. 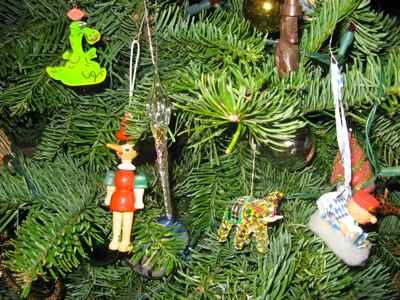 When we get home, we remove the key rings, and put on a colorful bow, and voila, an ornament. The kids love it as we look at them every year. Thanks for writing to us about this Lara, it’s a great idea. We do the same thing... well, almost. We took the liberty of adding a few photos of our Christmas tree and some of the travel memories we enjoy every year. Through the years we've collected little trinkets from most of our trips. 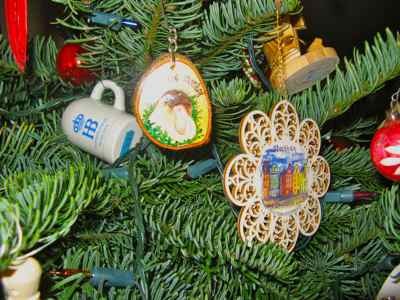 Many of the countries we’ve traveled to do not celebrate Christmas, so we’ve come up with some inventive ways to collect travel souvenirs for the Christmas tree from them too. Sometimes they are Christmas ornaments, sometimes they are key rings... That key ring rack is a really good place to look for something that is light weight, packs easily, and brings a giggle when you put them on the tree. Sometimes we just get what we call a "tacky tourist curio". We've got a tiny little mug from the Hofbrauhaus in Munich... glittery mirror-covered elephants from Thailand... a little camel from Egypt... a curly toed-slipper keychain from Turkey... a little Greek urn from Athens..., and a little bitty cuckoo clock from Switzerland.... and it really works! It brings back memories of where we got them too... that raucous dinner in the Hofbrauhaus... the tiny shop near our hotel in Bangkok... the souvenir hawker near the Pyramids in Cairo... the Grand Bazaar in Istanbul, and the clock shop in Switzerland where my sister bought a real cuckoo clock. We've got enough travel memories to decorate the whole tree now. 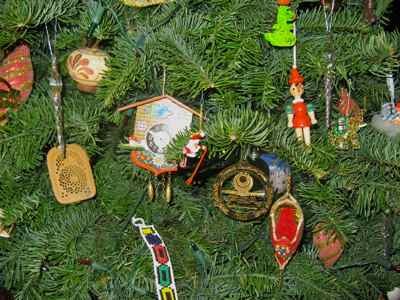 We collect them through the year, and each year we add the new ones to the tree. When we take the tree down, we put each one in its own zip-lock bag with the date of the trip, and where we got it. So far we do always do remember where we got them, but it can't hurt to have it written down... and one thing we don't always remember is the dates... if fun to remember that too... and who we were traveling with when we got them. When we decorate our tree each year, it probably takes twice as long as it should because we stop and talk about each trip as we take the ornaments out. Just like you said it brings back all the travel memories at Christmas time. Keep on traveling and collecting those travel memories at Christmas. What a great education for your kids, eh? 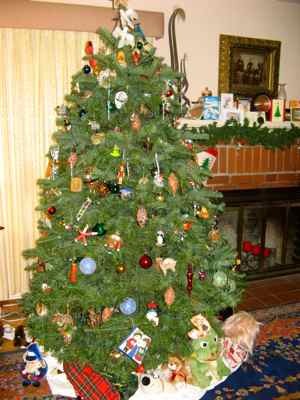 Just put up our Christmas tree... fun memories. Join in and write your own page! It's easy to do. How? Simply click here to return to Your Travel Tips.